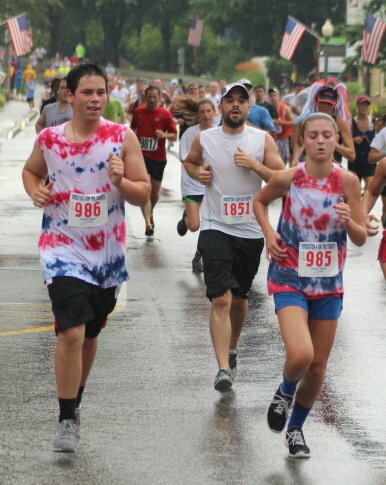 (Bridgton ME) Moninda Marube made it look easy for the second straight Bridgton 4 on the Fourth. 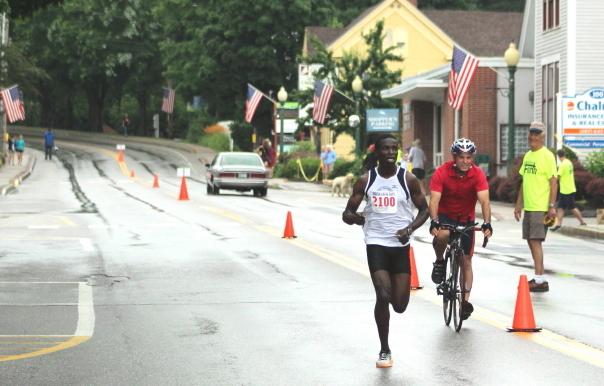 The Auburn (Maine) resident, formerly of Kenya, finished the course in 20:29 which was actually four seconds slower than last year’s winning time. Moninda ran down Main Street without a challenger in sight. I am guessing that the 35-year-old could run closer to the course record (18:46) if someone pushed him. There was no one capable of doing it last year or this year. Maybe next year? The temperatures were in the sixties with occasional drizzle. There was a rumble of thunder about forty minutes after the race started that got everyone’s attention. Annika Pfitzinger of Auckland, New Zealand ran away with the woman’s title defeating runner-up Jenna Willett by over two minutes. 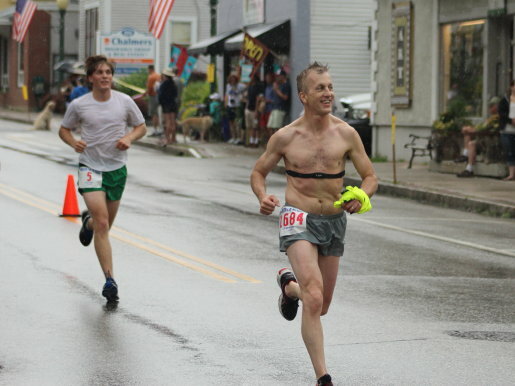 The Bridgton race seems, in my opinion, to annually attract a ringer or two. Annika fits that category this time around. The 21-year-old finished second in the national cross country championship in New Zealand last year. Both of her parents are former Olympians. 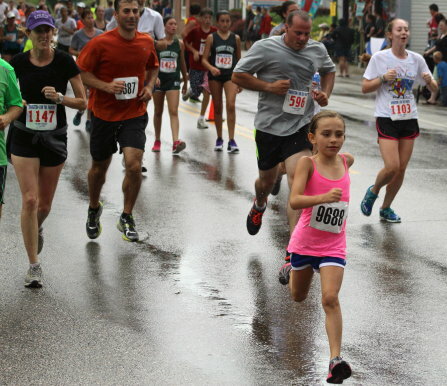 Annika was seventh overall (22:32) in the 38th running of this race. I like to watch the start of this race and then move to the Magic Lantern area to catch the Main Street section down to Renys. The race of the day was for second in the men’s division between Matthew Methot, Silas Eastman, and Robert Hall. Matthew (Maine Maritime Academy grad) went past me with a five-yard lead over the other two and I thought that he looked strong enough to hold onto second place. But it didn’t work out that way. Silas (Colby freshman) caught Matthew and took second by three seconds. Robert (Syracuse freshman) ended up seven seconds back in 4th place. Silas won the race two years ago and then last year was a disappointing 7th. 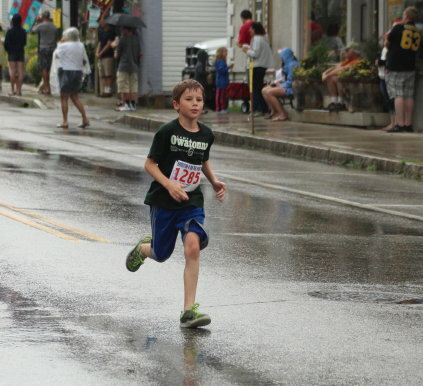 This year he improved his time by over a minute to get second place. 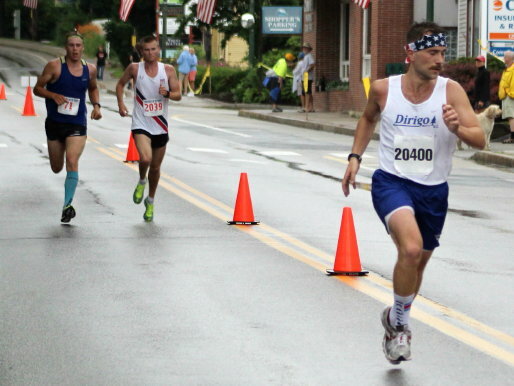 Chris Garvin of Charlestown (RI) took 5th with a career best 21:53. Chris was 12th last year. Nate Richards (6th) is a counselor at Camp Newfound. The 19-year-old took a minute off of last year’s 14th place finish. He is attending Principia College in Elsah, Illinois. Annika Pfitzinger (21) was 7th. She reacted to a group of well-wishers in front of the Bridgton Library. 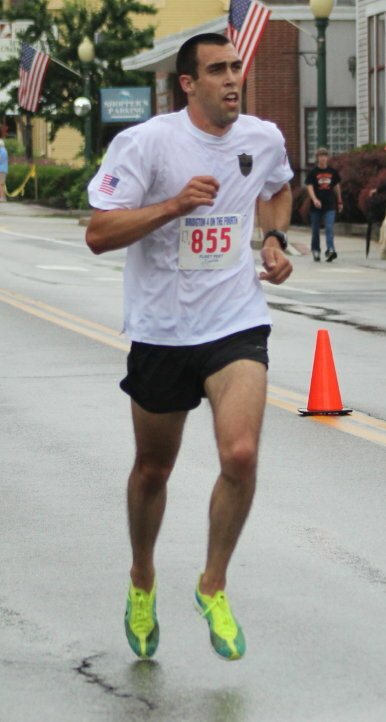 Eric Rudolph from Augusta took the eighth spot. Eric (30) is a graduate of Unity College. He was a cross country academic All-American there. 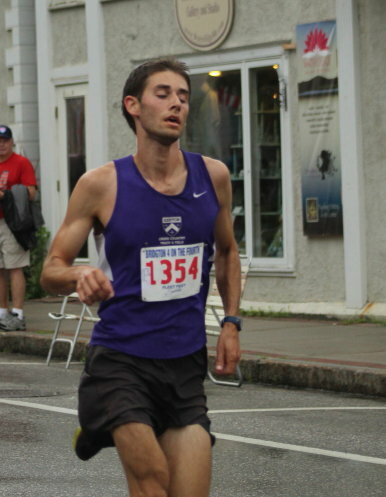 Ian Lanza (9th place) is a doctor from Rochester, Minnesota. 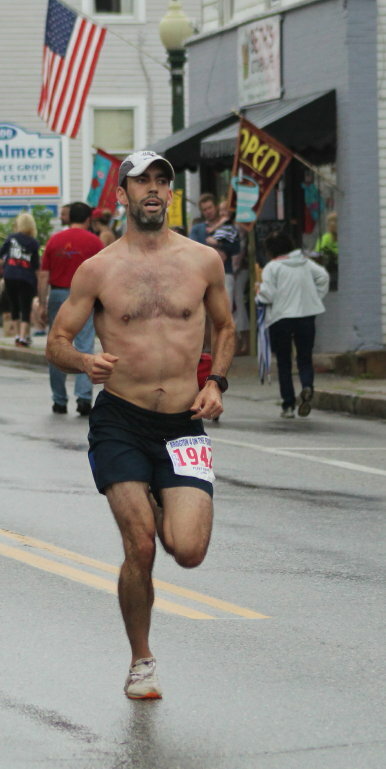 Ian (37) ran at UNH and did graduate work at UMass Amherst. 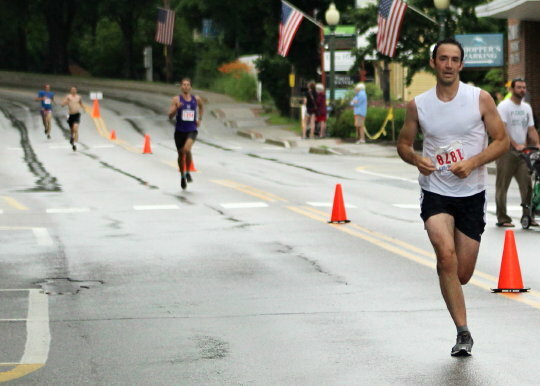 Ben Tanoff finished two seconds behind Ian in 10th place. Ben (21) is a counselor at Camp Indian Acres in Fryeburg. He ran for Kenyon College in Ohio. 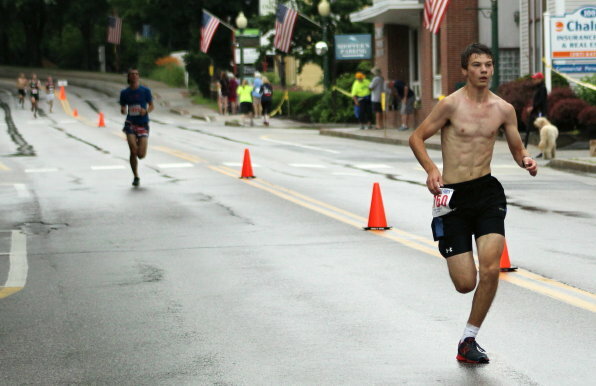 Youngster Nicholas Brown (16) finished off the top ten males in the race. 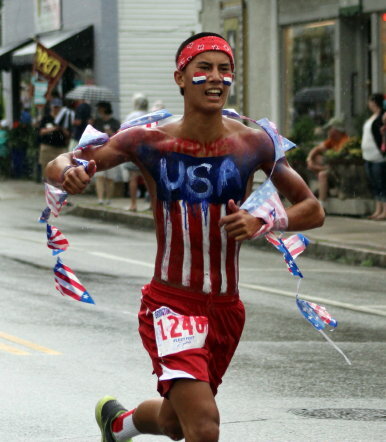 Nicholas is from Madison (Maine) and runs for the Granite State Flash. 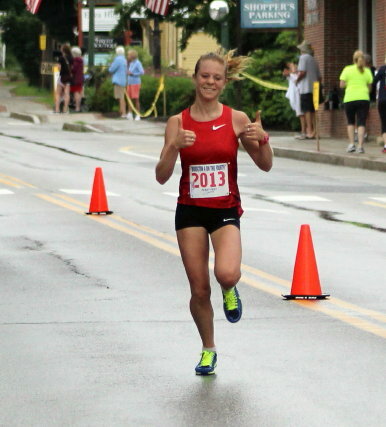 Jenna Willett from Denmark (Maine) was the second female (23rd overall). The Kenyon College grad was second last year as well. 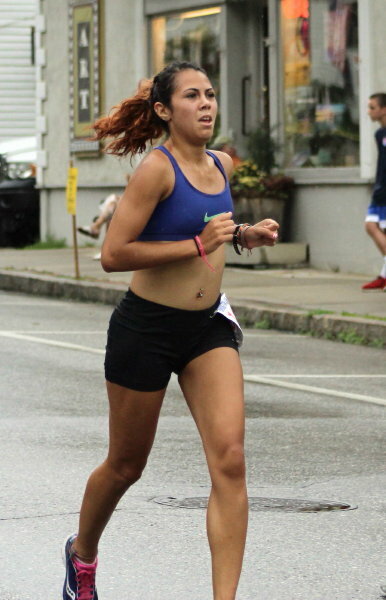 Newcomer, to me, Erin Flynn from Newton (Massachusetts) was the third female finisher. Robert Hall (4th place finisher) was part of Scarborough’s state championship outdoor track team in 2013. Robert won the 1600 meter at that event. Weather? I thought it was terrific for the runners. Cooler than it had been with no sun. 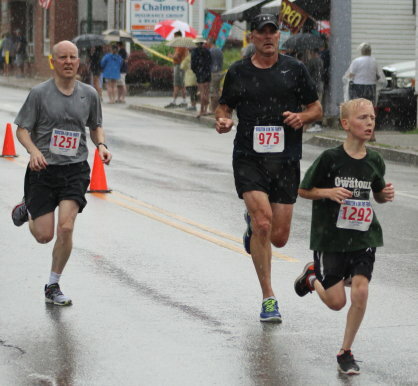 The off-and-on drizzle probably felt good to the participants. My camera wasn’t thrilled, however! One improvement I liked was not having any cars parked on Main Street. 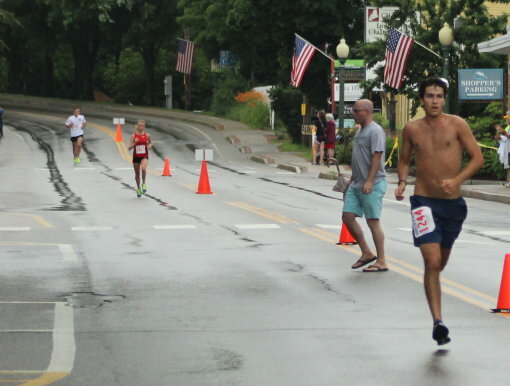 I also liked the idea of keeping the runners on the right hand side of Main Street. 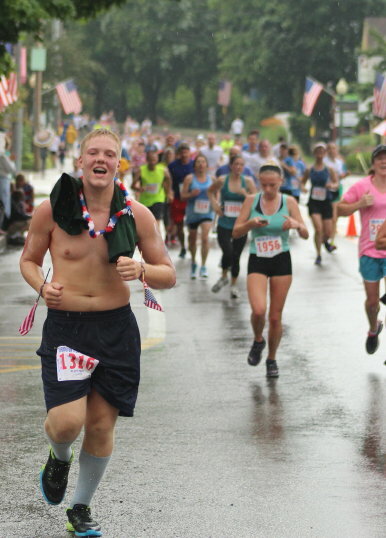 If you’re looking for excitement you’re sure to get it while waiting for the runners to finally pop onto Main Street. Every year, without fail, some driver will try to become part of the race. This year two drivers entered the “what-could-go-wrong” zone in the last minutes before the runners appeared. The first one pulled out of the Big A planning on heading toward Reny’s. He was stopped in a hurry but opted to converse with a race staff member about why he needed to continue the way he was going. He was finally convinced to turn around which seemed to take forever. The other driver came out of the side street across from the Big A driving a truck. 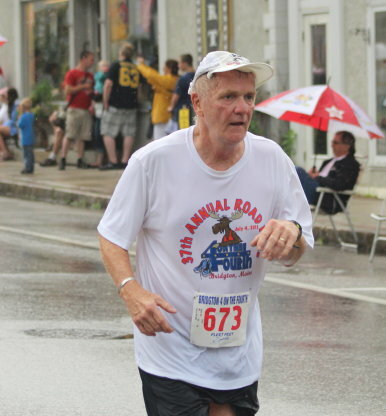 He headed up Main Street toward the spot where the runners get onto Main Street. No one stopped him and he went up the hill toward the monument literally seconds before the runners showed up. That one could have been ugly! I commend the race staff for their overall organization. The same folks appear to be in charge every year and they know what they’re doing. Always impressive at the 4 on the Fourth is the patriotic garb. The participating camps really seem to take it on. In a world where things are anything but rosy, you sense optimism about this country among the younger set.